Surround yourself with stunning panaoramic ocean, mountain and farm views, relax in the spa while enjoying the view. Enjoy a unique getaway situated on a fully working dairy farm. 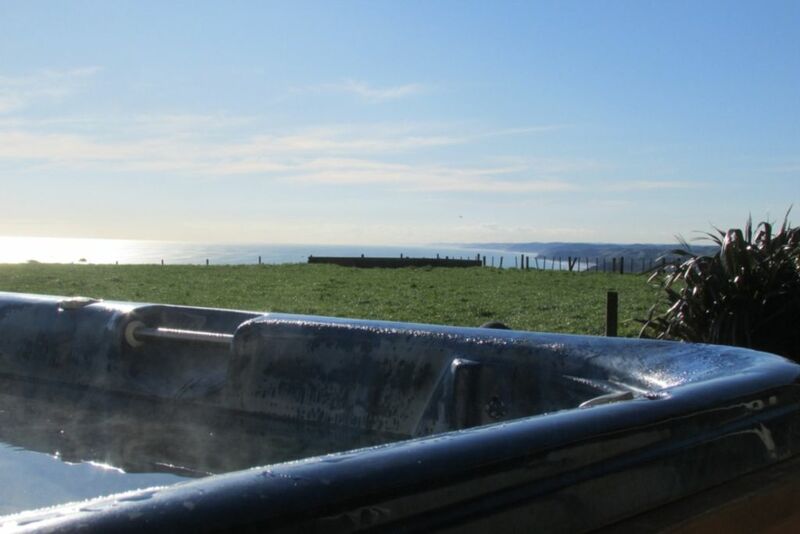 You may watch the cows being milked and have a go if you wish, or pat the pet sheep and goats and watch the chickens stratch and play or just sit in your own private spa or the shared swimming pool and watch the sun set over the Tasman sea and farm land the choice is yours.The price is $120 to $130/double/night plus $15/ extra person. The price is $120 to $130/double/night plus $15/extra person. Min of two nights at weekends. Lovely stay. I would defnitly come back and would defnity put others on to. Was good to relax in the country with the wonderfull views. We will defnity come back. Really nice hosts and stunning environment. Highly recommended. We really enjoyed our stay at DreamView Farm. The accomodation was cosy and had everything we needed. Loved relaxing in the spa taking in the incredible views of our rugged West coast. Added bonus was being able to take our dog and my horse. Had some lovely rides around the farm. Would definitely stay again. Bronwyn made us feel very welcome. Complete privacy from the main house. Love the spa, deck and views. Love this place! This was the third time we have been to dreamview and we will go back! The spa and shared pool and amazing and of course the views are to die for. It has everything you need to enjoy your stay and is a short drive away from the town centre. Our go to place for a getaway. Lovely hosts and very pleasant to deal with, thanks for the amazing stay... again!